You are here: Home / exercise / Can Your Favorite Childhood Drink REALLY Help You Achieve Your Fitness Goals FASTER? In recent years chocolate milk has gained a reputation as perhaps the best drink for post-workout recovery, but is this reputation truly warranted? With its combination of whey and casein protein from milk to help muscles recover and carbohydrates to replace the energy burned in your workout, chocolate milk does provide a healthy combination of macronutrients for athletes and those who work out frequently and strenuously. Chocolate milk also serves as a very economical option for post-workout recovery, often costing roughly a third less than protein powders, bars and other “sports and recovery” supplements. Why chocolate milk after a workout and how effective is it? So just how effective is chocolate milk and why has it earned its reputation as an “endurance superfood” in recent years? [pro_ad_display_adzone id=”8825″]Before we get into its efficacy, it’s important to first differentiate between using a recovery drink or supplement like chocolate milk after strenuous exercise as opposed to regular exercise. If you’re not engaging in extended, intense cardiovascular exercise or strenuous strength workouts, chocolate milk and other recovery drinks are unlikely to provide many real benefits. But when it comes to strenuous workouts, the long-standing rule of thumb is that in order to replenish glycogen stores in muscles following intense exercise you need to consume a recovery drink or meal that contains a ratio between 3:1 and 4:1 of carbs to protein within the first thirty to sixty minutes after exercise. Chocolate milk trumps sugar- and carbohydrate-heavy drinks like Gatorade and Powerade in this area, as it offers both high-quality protein and carbohydrates and does so in a mix that is close to the ideal 3:1 to 4:1 ratio. The protein in chocolate milk contains essential amino acids that help stop muscle breakdown and stimulate muscle repair. The carbohydrates help replenish your energy stores, replacing some of the calories burned in exercise and providing energy to burn in your next exercise session. 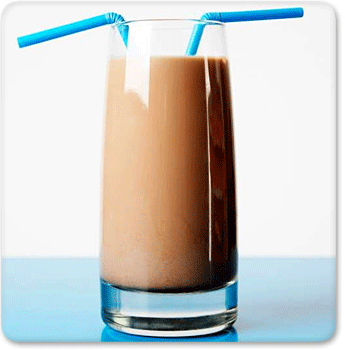 Chocolate milk also includes like potassium and sodium as well as water content to help you rehydrate and recharge. A number of recent studies have confirmed that chocolate milk offers benefits to endurance athletes. One study conducted at Southern Connecticut State University found that athletes who drank chocolate milk compared to a more sugar-rich sports drink had higher concentrations of glycogen, or muscle fuel, in their muscles an hour after exercising. These higher glycogen stores help provide athletes with the energy and ability to perform better and more quickly for their next workout. The athletes in this study also showed those who consumed chocolate milk had increased skeletal muscle protein synthesis, which means their muscles were able to recover and rebuild better than their counterparts. A similar study by Physiologist Joel Stager, director of the Human Performance Laboratory at Indiana University, concluded that endurance athletes like cyclists, swimmers and long-distance runners who drank chocolate milk performed and recovered just as well or better than those who drank Gatorade or the high-carb sports drink Endurox R4. Stager says the high carb and protein content in milk make it an incredibly effective recovery drink, even though it’s hasn’t traditionally been marketed as one. It should be noted that these two studies and several others like it were supported in part by milk and dairy industry groups like the National Dairy Council and National Fluid Milk Processor Promotion Board. Oh, and we almost forgot to mention – it tastes great! So as long as your stomach can tolerate dairy without any issues, chocolate milk should certainly be considered as an endurance superfood and a great option for helping you recover from your strenuous workouts! Lunn WR, Pasiakos SM, Colletto MR, Karfonta KE, Carbone JW, Anderson JM, Rodriguez NR. 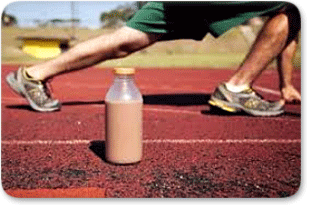 Chocolate milk and endurance exercise recovery: protein balance, glycogen, and performance. Medicine and Science in Sports and Exercise [2012, 44(4):682-691]. DOI: 10.1249/MSS.0b013e3182364162.